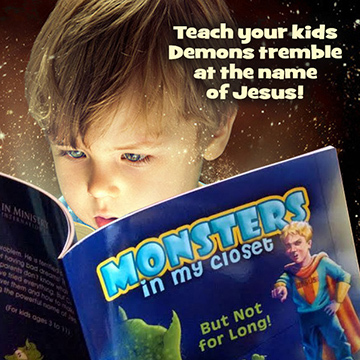 Kids in Ministry My Child Sees Monsters! Help! It was because of emails like this one that several years ago I decided to write a book for children who were haunted by not just nightmares, but night “terrors.” These were not the traditional clinical experiences that could be accounted for by the medical field. These were episodes that went beyond the norm where the victims were having true demonic encounters in the night. 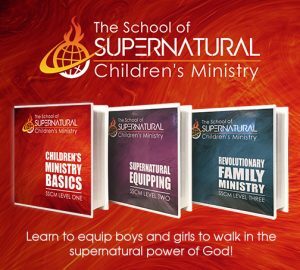 So I collected the stories of many people who overcame these attacks when the children learned their authority in the name of Jesus. I wove elements of their experiences together to craft the make-believe story of Caleb, who has a problem. He is terrified of the monsters in his closet. He’s not having bad dreams. These visitors are real! His parents don’t know what to do to help. It seems they have tried everything. But then Caleb learns he has authority over them and how to make them go away forever by power in the name of Jesus. 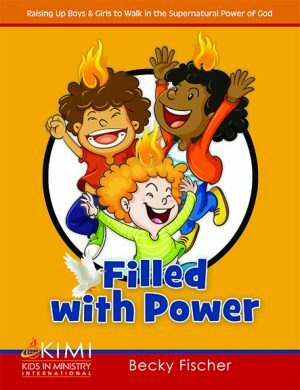 There is a section of helps in the back of the book specifically for parents to learn to help their children to become overcomers in this area. If you are a parent who has a child like this little boy below, please consider buying this book. You can see how it helped this family. My son is 7. From the day he was born he has ALWAYS tried his hardest not to go to sleep. He explains to me that it is because he has scary dreams. He still sleeps in my bed every night due to fear. I first suspected he was seeing spirits before he turned 1. We had moved house, and at night he would cling to me, body rigid and crying, pointing to a corner of the room saying ‘lady’, ‘lady’. In another room, where his sister 14 years older than him would see movement and hear noises, he would look fearfully at a point in space, and on one occasion said ‘gare’, meaning ‘I’m scared’. This was before his first exposure to the concept of ghosts on a cartoon. My children and I have always avoided anything remotely scary or violent on TV. He would also say ‘little moon’ and when we pointed the camera at those moments we would consistently capture images of ‘orbs’, which on the face of it are very similar to what photographers attribute to dust specs or sunspots on the lense. I burned sage to try to clear the house and at that point my son became more scared of the ‘orbs’ – it was as if I had simply stirred ‘them’ up. We have lived in three homes since then. In some my son would describe what I’ve heard called portals, with monsters coming out of them. He still cowers under my blankets describing “ghosts” he can see and hear. I was raised an atheist. I used to be engaged in some New Age practices, including reading tarot. My son’s father (who I left five years ago) has always used cannabis heavily. Jesus called me last year and I walked through the doors of the local Church on tenth July. A day or two later, the Holy Spirit lead me to open my brand-new Bible at Leviticus 23:27 ” the tenth day of this seventh month is the Day of Atonement;”. Praise God! Jesus called my son five weeks later. The Holy Spirit has helped me to clean up my life, and I am baptized. My Church doesn’t baptize children, but my son started speaking in tongues about a month ago. A few days ago I was laying in bed next to my son and felt prompted to pray out a couple of spirits from in myself (hey we should all be cleaning house regularly!) – I did this silently in my head: I gave no outward indication that I was doing anything. Next instant my son froze, and I asked ‘Are you seeing something?’. He pointed just above my body and whispered ‘ghost’. Hey if you’re still reading thanks! 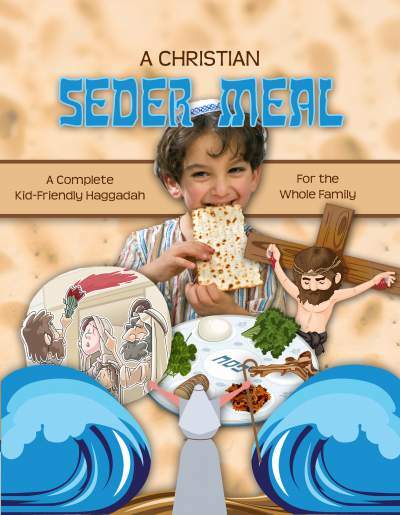 It was this experience that prompted me to look online for a Christian resource to help my son. In short, I found this book. I was able to download the pdf instantly. I read it with my son, and it was very moving to see him go ‘that’s me!’ every time I read a description of Caleb’s experience. I could see that at the very least the text was affirming for my son. We learned a lot from the book, and the information at the end of it. I helped my son practice declaring his God-given authority in the name of Christ, and he got right into it. This is exactly what I needed to help him step into his place of authority. Now he is playing and singing in a way I’ve not heard him do for years. He is playing with his toys, giving out declarations and instructions left right and centre ‘by the name of Jesus Christ’. I prayed him through to God six months ago, but he was keen for me to interrupt reading to help him repent and ask Jesus into his heart again. That first evening I think he started with role play – offering to clear the house room by room! Shortly before he slept he was describing spirits making holes and “marching out.” I encouraged him to close the holes behind them. One in particular I have no doubt was real. He suddenly froze and described a spider in the wall with three eyes and long teeth “and it’s having babies.” He was clearly terrified, but he launched straight into telling it to go and it left quickly with its babies. Poor thing, he never bothered describing them in detail before, probably because my response was always a mixture of helplessness and frustration. He’s already like a different child. I suspect he will experience school differently now as well. I’m looking forward to supporting my son to use his newfound sense of authority next time he sees ‘ghosts’. This has been a most amazing light in the darkness, and interestingly, God told me this morning ‘I have a surprise for you.’ A solution to seven years of torment? That’s some surprise Lord! Thank-you Becky, and God bless you and your ministry! I know you have taken risks to do God’s will. Your work is absolutely needed. ~ Ellen E.